Learning how to draw flowers is one of the most popular topics for both new and experienced artists. This page will give you general info that you can use to help with your own drawings as well as specific lessons at the bottom of the page for more focused study. It's best to consider the flower from the inside out. What that means is that you'll start at the bud, or center of the flower and work your way outwards to the petals and then finally to the stem and leaves. It is important to have a technique or method that you can follow each time you draw a new flower because over time you'll become better at this technique and your drawings will become easier. It is always easier to follow a formula than to reinvent the wheel every time. Sometimes the middle of the flower may be hidden from view by the leaves or petals and when this happens it up to you to use your imagination and reference images to draw out the entire middle part before moving on to drawing the petals. This helps to train your mind to draw what you see and also to think through how the flower is made. This skill of being able to "see more than what is there" and "think through an object" is very important as you develop as an artist so do your best to take this seriously and practice as much as possible. Like any other skill, the more you work at it the easier it will become in the better your results will be. There's no real trick to drawing this part of the flower. Always try to remember that are flower is a three-dimensional form that is often arranged in a circular or cylindrical way. As you look at pictures of flowers start to become more aware of how the petals look from different angles. Do not get discouraged if the petals seem really hard to draw at first - the more you work at it the better you'll get. This is the easiest part when learning how to draw flowers. The stem is generally just two slightly curved lines. You can apply the same knowledge that you learned while drawing the petals to draw any leaves coming off of the stem. The following lessons contain more in-depth information about how to draw flowers and trees. Add some life into your cartoon drawings by adding some cartoon trees into your scenes. It won't take long to learn and master this easy lesson. Add some personality to your drawing scenes by learning how to draw this cute cartoon flower and then combining it with your other drawings. Go through this step by step lesson and learn how to approach drawing a complex flower shape like this rose. 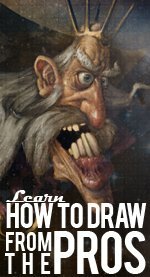 Learn which parts to draw first and how to draw what you see to get the best results possible. Learn how to draw a lotus flower while discovering a formula for drawing that you can use over and over again to draw all different types of circular shaped flowers. Drawing Roses - Medium - Video Lesson! Roses aren't impossible to draw, but they do take a little work. Drawing step by step I will show you how to create great looking roses every time. In this lesson you'll follow a step by step approach to drawing palm trees. Like the flower tutorial above this complex object has been broken down into simple parts to make the drawing process as easy as possible. Take your doodles to a whole new level by diving head first into this cartoon drawing lesson about drawing colorful cartoon flowers. Learn what it takes to make a simple cartoon tree that looks great and isn't that difficult to draw.